After a July 3 ceremony, Indiana now has 96 new citizens. 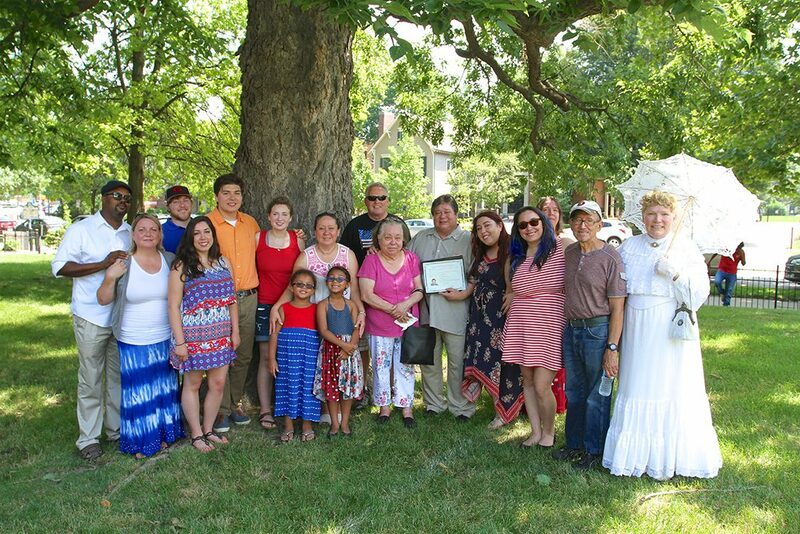 The Benjamin Harrison Presidential Site in downtown Indianapolis served as the backdrop for the naturalization ceremony, just in time for participants to celebrate their first Independence Day as an American citizen. People from more than 37 nations participated in the ceremony, presided by U.S. District Judge Sarah Evans Barker. U.S. Immigration Services Officer Darren Dapas took a roll call of each country, upon which new citizens stoood, received a new American flag from a child in the audience. Flags were provided by the Daughters of the American Revolution. Kimball Harrison Morsman, the great-great-grandson of President Benjamin Harrison, offered some welcoming remarks. At the end of the ceremony, information about services was provided to new citizens, including voter registration forms by the League of Women Voters, information from the Social Security Administration and passport applications from the U.S. Postal Service, among other items. 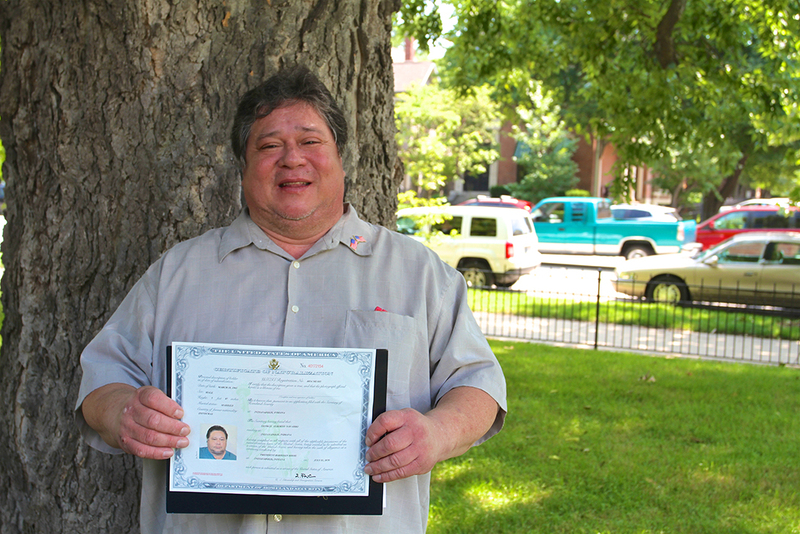 Lawrence resident George Navarro, born Jorge Navarro Jr., was in the crowd to receive his certificate of citizenship. Navarro was only 6 months old when his family moved to the U.S. from Honduras in 1965. He grew up in Indianapolis and attended John Marshall High School. He now works as a painting contractor in the Indianapolis area. “I’ve been back to Honduras maybe a couple of times, but the last time I went was in 1979,” Navarro said. He began the naturalization process in October 2017. Navarro’s sister, Norma Gorsline, also came from Honduras in 1965 with the family but wasn’t part of the July 3 ceremony because she was granted citizenship in February. When asked why he chose now to become a citizen, Navarro said it was because of the growing national debate about immigration policy. “All of this (President) Trump stuff is going on, and my dad wanted us to do it because he was worried about us getting deported,” Navarro said. Now, Navarro, his sister and parents are all American citizens. His parents, Maria and Jorge Navarro Sr., applied for and were granted citizenship in 1985. Senior Judge Sarah Evans Barker of the United States District Court, representing the Southern District of the Indiana, presided over the naturalization ceremony at the Benjamin Harrison Presidential Site on July 3. Barker presides over approximately three naturalization ceremonies each year with her own tradition of handing out sparklers to new citizens during the ceremony nearest to the Fourth of July. “This year, we welcome 96 new citizens, all coming as full-fledged citizens, and in doing so, we mark the 242nd birthday of the United States of America. Each of you has made your own pilgrimage, coming from places all around the globe on journeys that have brought you here to this day, to this place and to this moment. As you complete that journey, you embark on a new adventure, setting out to craft a meaningful, contributing, happy life as a citizen of this country. “Even the tent that shelters us today has become part of the tradition. The wonderful symbolism of this tent is that it’s open all around, no walls. I like that. “It is no secret that our government is struggling to come up with workable, humane and just policies and procedures to deal with the overwhelming flow of people who are seeking refuge and safety and in search of new opportunities within our shores. You’re becoming citizens at a very challenging time in our natural history.